In this week's floral design class (Week 2), we learned a lot of basics--cutting and placing the foam oasis, wiring stems, symmetrical placement of fronds and flowers. Each student ended up creating pretty round-ish arrangements with baby carnations and leather-leaf. Last week, we were told to bring a vase or mug for the arrangement that had a mouth about 3" to 3 1/2" wide and was a medium height. After hunting at the thrift store and finding two vases for future arrangements, I went to T.J. Maxx and found a lovely hot cocoa mug that was pink and brown! Well, of course I had to get that. I was just hoping that my instructor was able to get the right color flowers for my mug. Imagine my delight when she brought out the flowers at the beginning of class (she procured them at the San Francisco Flower Mart yesterday), and one bunch was my favorite shade of pink. And it was the perfect pink for my mug! 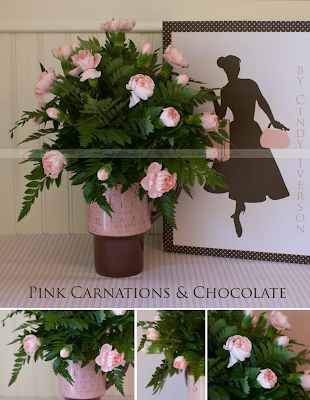 Another fun find at T.J. Maxx was the cute pink and brown box with the retro graphic that is featured in my portfolio shot of the floral arrangement. I'm teaching myself how to make fabric and paper covered boxes. This will be a fun one to recreate. The mug also came in its own little matching box so I have another "template" to play with. And in case you're wondering... the "Carnation Parfait" is still beautiful and looking fresh after a whole week! Amazing! I never would have thought that pink and brown would make such a wonderful combination, but the more I see it, the more I love it. Your photos are lovely, so is the flower arrangement! I love pink and brown and I love TJ Maxx whenever I am in the States. I spend HOURS in there hunting for stuff. The arrangement is beautiful. Cindy, I am really enjoying reading about your flower arranging classes. I hope you are going to continue to share these with us. This is one of my favorite color combinations. I bet you are having a blast in class! It's beautiful and I love the mug! Wow, it's stunning! Amazing how it all pieced together nicely. Great work, Cindy! Thank you for becoming a follower on my blog. I can't tell you how much it made me smile to see that despite me not blogging often, you still visited my blog. I was surprised anyone had stayed around, so thank you very much for sticking by me and my blog. With Beth back at college after the holidays, I might be able to blog regularly again if I can borrow her laptop whilst she's at college. Sounds like you are having a great time in your floral design class! I love seeing the pictures of your arrangements. Keep up the good work! How pretty, Cindy! I love pink and brown together (pale blue and brown, too) and this is beautiful. The carnations look like roses! Your creative talent continues to amaze me. I have never had the ability to arrange flowers. Real or fake. My daughter seems to have that knack though. Your floral arranging class must be great fun. The cocoa mug worked out perfectly! Pink and brown has always been a winning combination for me. My mother, bless her heart, painted our living room in 1973 in a beautiful pink and we had those plush chocolate sofas and chairs. For some reason, those two colors really compliment each other. I love the floral arrangement and bad news...I have an orchid that is not doing well. The petals are falling at an alarming rate. Any suggestions? so many wonderful photos over the last few posts. i love the blooms on the dark bark with the bluest sky behind it. all are very lovely. Pink and chocolate brown are indeed an enticing combination. I went to Navlets today and couldn't find a Happy Wanderer. BUT I did find a replacement for my First Prize rose that I had for 8 years and died last summer. Yay! Simply beautiful, Cindy. I love pink and brown together. This is just darling. Great find. How fun to be taking a floral class...which would be right up your alley to display all your gorgeous roses. The pink and brown do look nice together:) Cute mug. I am hoping to pick up some pointers from your photos. Beth... It was almost *C*!